I wanted so badly to vindicate my Park City cowardice this summer, when I didn’t have the nerve to ride on the country’s longest alpine slide. Vindication will have to wait for another day. Two weeks ago, we road tripped to Syracuse, NY, mainly for the grand opening of the WonderWorks attraction in the Destiny USA mall. WonderWorks, which we know from Orlando, has opened its first northern U.S location here, but with a twist. 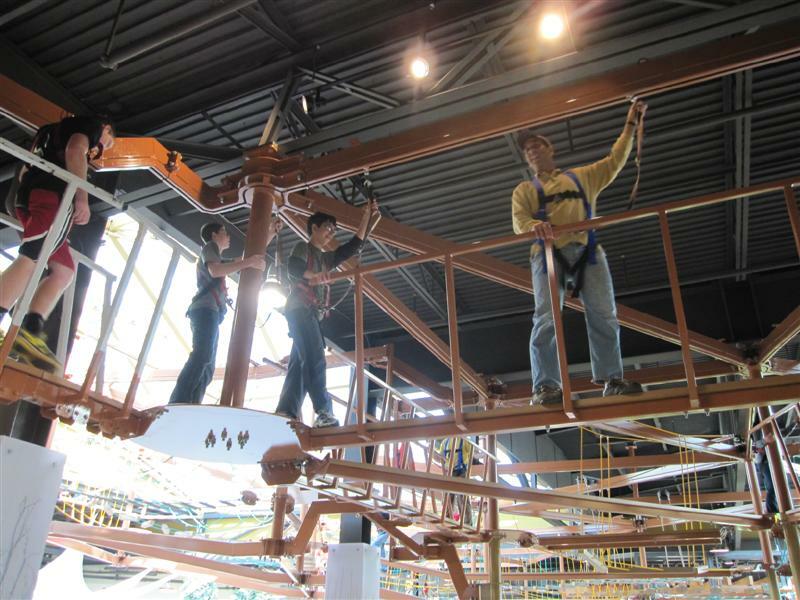 It contains the Canyon Climb Adventure Ropes Challenge Course, the world’s largest suspended indoor ropes course. I was SO sure I could face my fears, get harnessed up, and go out there, even just a short way. And if I couldn’t, I would just send the husband. And I knew that the rest of WonderWorks would be a treat for the kids. If you’re into daredevil thrills and adrenaline rushes, you will love this course! 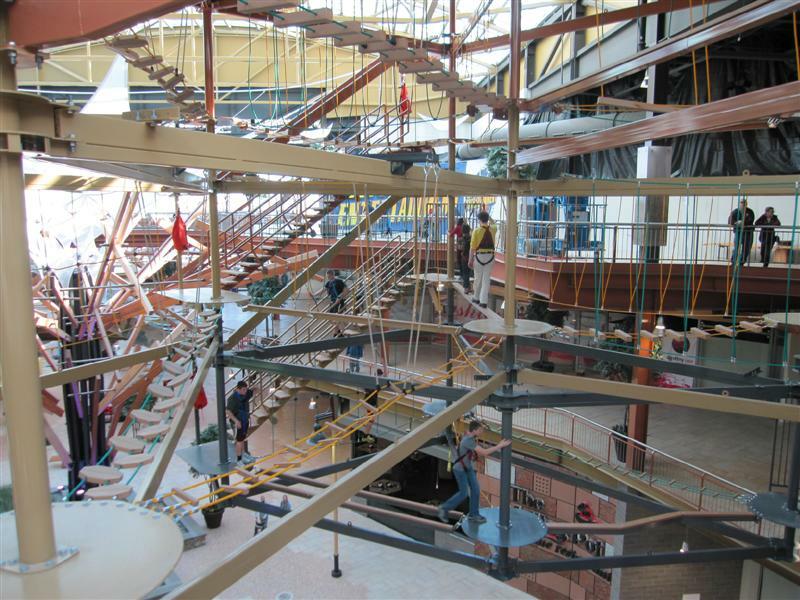 What propels it above other courses is the fact that it’s suspended from the cavernous mall ceiling, leaving you walking across ropes and narrow beams with nothing between you and the ground, 70 feet below your feet. There are more than 80 different obstacles and activities, including swinging steps, lily pads, and a tremor bridge. Do you SEE those little dots at the bottom? Those are the people on the ground floor, 70 feet below! How many of these did I experience? Zero. But I did get harnessed up, and climbed the stairs to the first platform. But then, the beam looked so very narrow…just right for this fearless four year old who came out of nowhere and took off past me toward the other end. We all attempted it, actually, and The Girl chickened out too. I’m proud to say that while The Boy — who loves his terra firma just like his momma — didn’t make it out past where the third floor ends, he did complete a small loop with quiet dignity and grace. In the end, Matt was our soldier. He didn’t complete the entire course (which can take up to an hour), but he did get out over the mall courtyard. This is Mr. Brave in action. He’s starting from the right side of the screen, slowly and carefully working toward the middle. Thirty seconds in, note the fearless guy on the left practically bounding across the plank bridge! WonderWorks mixes the best elements of a children’s museum, science museum, and high-tech video arcade. When you arrive, everything is upside down, until you travel through an “Inversion Tunnel” into the main area with more than 100 hands-on exhibits. Some of our favorite experiences included the Hurricane Shack, where you feel the effects of a Category One hurricane with 84 mph winds. The Boy and I “played” Mindball, which uses EEG biofeedback to move a metal ball either toward or away from you, depending on how calm your brain gets. Mr. Never-Worked-A-Day-in-His-Young-Life easily won this. I used my loss to guilt him into lying on the bed of 3,497 nails, an experiment to test the effect of pressure and force over area. He also thought the EVA astronaut suit was cool, as well as the Mercury Capsule. 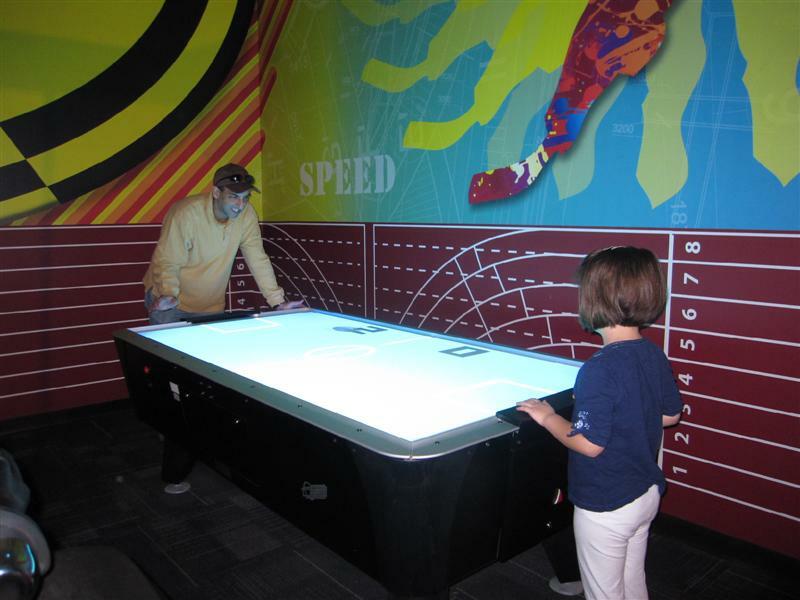 The Girl enjoyed playing in the Bubble Lab, dancing to the colors of light in the Recollections area, and playing Virtual Air Hockey on a touch screen with Matt. My BIG adventure that day was my first game of “lazer” tag, played with a group in a blacklit maze (at an additional cost). Another thrill for me was the 4D extreme motion simulated thrill ride in the XD Theater, which is included in the price of admission. See? I can handle thrills…as long as I’m buckled into a seat which never leaves the ground. For ropes course fans, this place is a must. For chickens, WonderWorks offers a heckuva lot, too! During our visit, we stayed at the Genesee Grand Hotel, which put us close to everything in the city, but in a quieter neighborhood. Recent renovations and some upscale amenities make this property very comfortable. 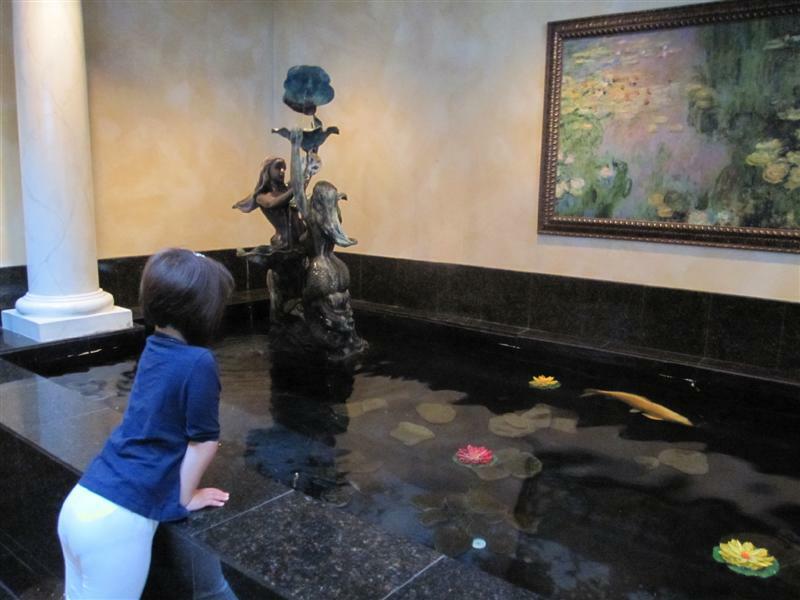 And The Girl was quite taken by the koi pond in the lobby! Disclaimer: Our visit to Syraucse was hosted by Visit Syracuse. WonderWorks provided us with complimentary admission. We’re thrilled that your family had such a great time in Syracuse at WonderWorks! Lazer tag sounds super fun, but I’m with you . . . I don’ t know if I’m cut out for the Canyon Climb Adventure Ropes course either. 🙂 I’ll have to give it a try and find out. Wow! Now that is one that we will definitely add to our list. Great post this week. OMG! I am so dying to try that ropes course! It looks awesome! WonderWorks looks like a lot of fun, too, and I think the kids would love it all. Ah, what an awesome blog post! I never knew this was here…def going to bring the family. Thank you for sharing! How long did you stay in WonderWorks? Do they have a place to eat in there? Thanks for shearing your experience! The Canyon Climb looks like the thing to do while @ Wonderworks! I am so buoyed up, even looking at the pic. We will be in NY by March 2013, so I guess this will be on the itinerary for some city adventure for the adventure backpacker like me! Thanks for the idea! This is definitely on my list for my next trip to visit my husband’s family. 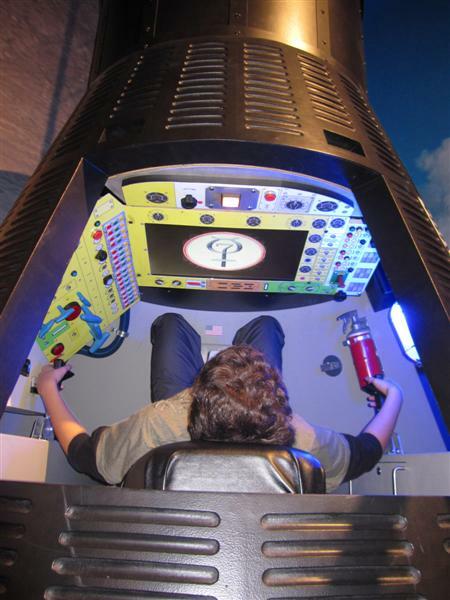 WonderWorks looks like quite an adventure for both adults and kids alike! I have got to try this, and lucky for me Syracuse is not too far away. I have just book marked your page and emailed it to my boyfriend so we can put this on our adventure to do list! Looks absolutely amazing. Definitely one of the places that need to go onto my list. The canyon climb looks awesome. Is there an age bracket for this adventure? who can and who can’t? is there like somewhat they called a package on this place? can’t wait to experience the inversion tunnel.. I can’t wait to try this with my family in this coming summer. 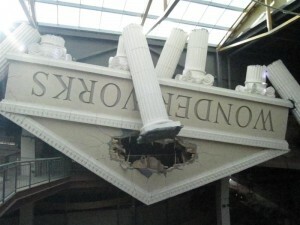 WonderWorks looks like quite an adventure and fun for my kids. The canyon climb looks like scary but it’s looks like great and fun to do with. It really is fun, and if you like thrill rides, you’ll like this. And, it’s good any time of year, because it’s inside the mall. Yes I’m planning this year with my family. Is there any package for this?